Makaronia tou Fournou means pasta baked in the oven and is a common dish in Cyprus, often served as a main course, with a salad but in Cyprus it is an essential dish during all celebrations. It is similar to Greek pastitsio with a different flavour and of course lots of halloumi in it. 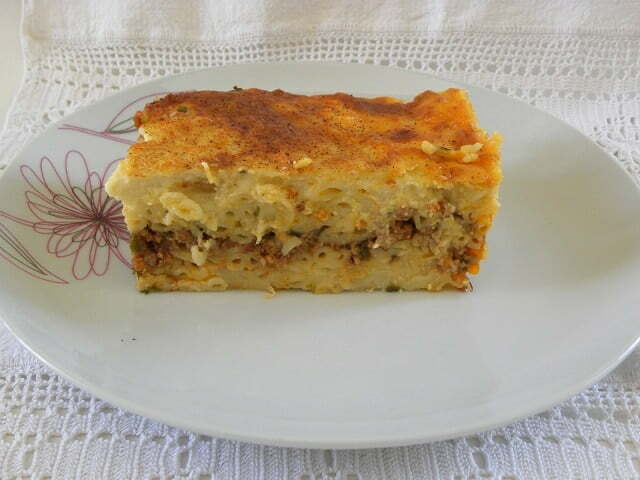 Like pastitsio it is a layered pasta casserole dish. There are variations throughout the regions of Greece with a few minor different spices, the Cyprus version having cinnamon as it’s main spice. The bottom layer is bucatini or other tubular pasta with cheese and egg as a binder, or some of the béchamel cream. If we do not add the cream our pasta will not stick together but will spread in the plate during serving. The second layer is a ground meat sauce (usually beef or veal but it can also be substituted with pork, a mixture of veal and pork mince or chicken or turkey mince) with fresh tomatoes and cinnamon, (cloves, nutmeg and allspice are a few other spices used in other regions). On top of the sauce there is another layer of pasta and on top of that is a thick creamy Béchamel sauce with grated anari or halloumi and mixed in the pasta as well as in the béchamel sauce and some sprinkled on top together with a hint of cinnamon. It can be eaten hot but leftovers are even better the next day. In a sauce pan bring water to boil and add salt. Cook the pasta al dente according to the package instructions, for about 10 minutes, as they will be cooked later on. Remove from the heat, drain and mix a tablespoon olive oil. Heat the olive oil in a sautéing pan and sauté the onion until translucent. Add the ground meat and sauté for a few minutes. While mixing, add salt, pepper, cinnamon and tomatoes and cook over moderate heat for about 15 minutes. Remove from the heat and mix in parsley. When the bechamel is ready, mix in 2 heaped tablespoons. In the meantime beat the egg white, reserved from the Béchamel sauce, and mix with the pasta as well as a few tablespoons of grated halloumi or anari and crumbled mint. In a baking tin (35 x 30 cm – 13.8 x 11.8 inches) layer half pasta. Put the ground meat on top and add the remaining pasta on top. Cover pasta with the Béchamel sauce and sprinkle with some grated halloumi and some cinnamon on top. Bake in a preheated oven to 180ο C / 350o F, for about 45 minutes to 1 hour or until golden on top. Tip: When making the Béchamel sauce, reserve an egg white to be mixed with the pasta. This helps to hold the pasta together. This recipe and many more Cypriot recipes are included in my cookbook Mint, Cinnamon & Blossom Water, Flavours of Cyprus, Kopiaste as well as in my e-cookbook, sold on all Amazon stores. I think Haloumi would be wonderful in a Pastitsio…a family favourite. I am so glad that I discovered your blog through comments on Peter’s blog. I have a passion for Greek food and was lucky enought to spend 5 weeks there last Spring. I love the fresh produce available there. I spent 8 days on the island of Kea at Aglaia Kremezi’s cooking school. I loved the immersion into Greek family life!! !I found some Kefaloteri cheese in our small community here. It would probably go well in the pastitsio? Hi, Valli, I have seen you commenting on Peter’s blog and I am really a fan of his site. My recipes are just simple, every day recipes and hope you’ll like them. Kefalotyri goes perfectly well in the bechamel cream and sprinkled on top. However, because it’s a bit salty, avoid putting salt in the cream. I’m glad you got the link. I’ve just learned today from Peter that the pasta is call bucattini (but I am not still sure if that is only the brand). About pastitsio or pasticcio I think the first is the Greek way of spelling it as in Greek they cannot pronounce the “ch” sound, whereas in Cyprus we do and because this dish has its roots from the Venetians in the Italian language the double cc are pronounced as “ch” so it’s something like tom(ei)to and tom(ah)to (lol). Thank you so much for the recipe…..really gonna impress my family now! Thank you!!!! !